You have been reading about Funnel Hacking and how growth hackers like me are reverse engineering other successful money making sales funnels and profiting from it. What is “Funnel Hacking”, you ask yourself. Is it a new digital marketing skill or just another fad? How can I learn Funnel Hacking and do it like a pro? 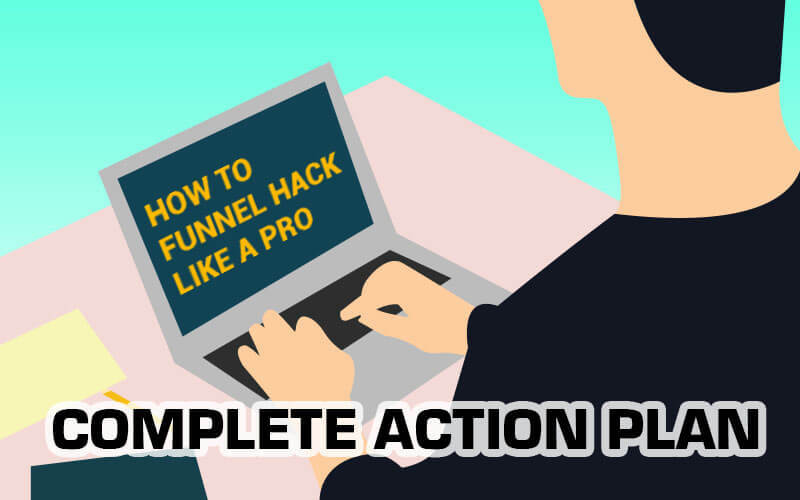 In this funnel hacking 101 guide I have all the answers for you and by time you finish reading, not only will you know what is funnel hacking but you will also be able to funnel hack like a professional. You’re going to learn once and for all what is funnel hacking, how to funnel hack, and how to make money with Funnel Hacking. If you’ve ever googled any of this before, you know that most people waste 10-20 minutes to explain to you just what a sales funnel is. And in the end, they don’t explain anything. This is not what’s going to happen here. As an experienced marketer who has built sales funnels for clients that generated up to 5 figures easily, I know what I’m talking about. So, I can promise you that if you read all the way ‘til the end, you’re going to know everything you need to build your own sales funnels and double, triple, even 10X your current revenue. You’ll learn about growth hacking funnel techniques and things you didn’t even know you needed to learn. Did you know that businesses fail to convert 79% of their leads into customers? Did you also know that the businesses that use ClickFunnels have a 41% increase in their sales revenue? Both of these stats are the direct effect of your sales funnel’s efficiency. This is why having a sales funnel is so important for your business, and having the right sales funnel is even more important. I want you to be able to follow the tips and tricks I have listed below and it is important that you have access to the tool I use for Funnel Hacking. I use Clickfunnels for this as it allows me to create fully automated sales funnels in a few clicks. No, you do not have to buy it. You can read more about Clickfunnels in my unbiased Clickfunnels review here. Clickfunnels offers a 14 days free no-obligations trial for you to try out their product. Click on the trial link below and signup for the free trial. You will not be charged if you cancel within 14 days. What is Hacking a Sales Funnel? Funnel Hacking Explained! What is Funnel Hacks System? Now that you have already signed up for your free trial and have access to your Clickfunnels dashboard, let’s continue. Take a deep breath. Don’t hesitate to read this article more than once. There’s too much information, and it’s totally normal that you might feel overwhelmed. Let’s start from the beginning. Okay, let’s start with the assumption that you’re a complete beginner. So, a sales funnel is a process in which we convert a targeted visitor into a prospect and eventually a paying customer. Now, there are steps that will take someone from a complete stranger to a customer. It’s almost a science, and if done right, it can bring thousands to millions of dollars to your business. Since I hate to stall and I don’t want you to waste your time, let’s talk in plain English. Imagine a real funnel. At the top is everyone that doesn’t know your business and at the bottom is all the people that buy from you, i.e. a customer. So, this process is made of steps that will get you visitors and turn them into leads, and then turn those leads into customers. It sounds a little complicated but isn’t. You can also imagine the funnel as a strainer. The whole purpose is to get the maximum number of visitors possible and turn them into customers. Basically, a sales funnel will increase your retention and conversion rate. As promised, in plain English, a sales funnel will be a series of pages that will take the targeted traffic you have (organic and paid) and qualify them as customers. Imagine a salesman at a store. A good salesperson qualifies their prospect. They make sure that the person that came through the door has the financial means and the intention of buying their product, otherwise, they would waste hours on people who are just passing by. That’s what the sales funnel will do for you and more. You’ll get quality traffic, and the funnel will qualify them for you and ensure that your page converts. So, the top of your sales funnel has the sole goal of making people know that you exist. This is all about branding. If you’re not a sole entrepreneur, this is the responsibility of your marketing department. The best way to create a brand is by creating quality content. It’s even better if you design your content, targeting your customer and not just everyone. You can do that with inbound marketing. Anyway, at the top of the funnel, you have to create blog posts, social media posts, videos, and advertisement to make people acquainted with your business. The goal is not just to make your business known, but also to attract the right customer. For example, if you spend the right amount of money on Facebook Ads, you’re going to get millions of views, but if your engagement is terrible, it means that your content isn’t speaking to your customer or being targeted appropriately. Once you create a strategy for the top of your funnel, it’s time to worry about the middle. This is the smoothest part of the process. You have the lead and you have to turn them into customers, but not quite there yet. Here your sales department, or yourself with your sales hat, have to initiate the closing of the sale. It is easy, but you can still mess it up. Do not spam people or use pain points too much to close the lead. People are sort of immune to those tactics nowadays. It will just eliminate all the trust you’ve built so far, and send the lead away. They want to buy from a business that they feel that cares about them. If you spam people, they’ll feel like all you care about is to make a quick buck off them. This is when you nurture the relationship with the lead. You can use email sequences and any relevant content to make the relationship between business and lead stronger. Finally, you get the bottom of the funnel. Here you’re going to need landing page hacks to turn those leads into customers. You’ll need the right copy, exciting graphics, and every tactic in the playbook to convert the largest percentage possible. You need to take all the information the lead already gave you at this point, gather everything, and turn them into customers. If you’re still thinking about whether or not you should have a funnel, as someone who’s built them many times, the answer is yes. The main reasons are that they automate the entire sales process and they build trust with your leads. Now, if it sounds like a lot of work, it is if you do everything from scratch and by yourself. As a funnel hacker who knows what he’s doing, I can show you an easier and better way of doing things. What if there was a way to find a pattern that works and you just needed to follow it, to increase your sales revenue as much as you want? If you want to find out, keep reading. If LeBron James’ coach offered to teach you how to play basketball, would you accept it? Or would you rather learn on your own even though you knew nothing about basketball? That’s what hacking a sales funnel is all about. In other words, you build your funnel modeling something that works instead of having to figure out all on your own, and probably failing instead of succeeding. Building a sales funnel can be hard. Building one that converts and gets the job done, it’s nearly impossible if you’re an inexperienced marketer. You need to know to code, copywriting, and testing. Learning this would take a whole year. Once you did learn everything, you would have to test it out in the real world, fail a lot, and try to find what you need to make it a successful funnel. Imagine all the hours and the money you’d have to spend. Even for big companies, it’d be a lot. So, why is funnel hacking so genius? Because it’s reverse engineering something that already works. You model your funnel after a funnel that is already working for your competition. Now, this isn’t stealing. It’s very different. When you hack another sales funnel, you model all the paths that make that one successful and apply to yours, but you never steal content and everything that belongs to another business. You won’t be taking their copy or their logo and putting on your page. What you’ll be doing is getting to all the stages of their funnel and implementing on yours. It’s the same process that the world’s most successful people use with NLP. NLP (neuro-linguistic programming) is an approach to communication and personal development. One of the main things NLP is famous for, it’s their modeling techniques. Basically, it states that if you model the behavior of successful people, you’re going to get the same success they have. This obviously means only the habits that made them successful. The same concept can be applied to sales funnel. If you model the patterns and paths that make a sales funnel successful, you can create one that will experience the same amount of success (conversion rate). It’s that easy. With funnel hacking, you’re going to be able to make sure that your sales funnel converts the visitors into leads and the leads into customers. With this technique, businesses don’t need to spend millions of dollars into testing what works and what doesn’t. Now, imagine that you could learn everything about funnel hacking from the best marketers in the world. They would teach you the ropes and give you a pathway that will ensure you succeed. This is all possible with the Funnel Hacks System. The funnel hacks webinar is a program created by ClickFunnels to teach you everything you need to know to set up your own sales funnels. With a program like that, you can find success right out the gate and have a real advantage over the competition. The truth is that this program is for everyone who’s serious about seeing real profits with their funnels. The most important part of the course and the main reason you should get it, it’s that it’ll skip all the months that would take for you to learn on your own, and make sure that you master hacking sales funnels. You’re also learning from a trustable source that is ClickFunnels. We’re talking about the company that revolutionized sales funnels in recent years. Russel Brunson, ClickFunnel’s CEO, is #1 marketer in the world. Before you buy the Funnel Hacks system I strongly suggest that you attend this FREE WEBINAR by Russel Branson. With all these credentials, it’s easy to understand why a course like that it’s a best-seller. You get all the tools and knowledge to start building your own sales funnels. It doesn’t matter if what you want to build is a landing page, an upsell page, ad copy, or even an email sequence. Whatever you have in mind, you’ll learn how to build, optimize, and succeed with it. Here’s a bullet list of what you get with this system. This is just a small part of the whole deal. This masterclass will take you from a complete beginner to a real funnel hacker. Now, before you go ahead and get yours, make sure this program is right for you. After all, you don’t want to spend money on something that you don’t need. I have a question for you. Do you have a business? Now, before you answer that, even if you’re a freelancer you still have a business. The better questions could be, does your job require that you get clients to make revenue? If the answer is yes, then sales funnels are for you. If sales funnels are for you, then Funnel Hacks System is for you as well. Every year more people connect to the internet. We’re around 4.2 billion currently. The numbers tend to increase. Now, this is all great news because there’s more attention. Still, the competition is fiercer. Every day new companies emerge, and the ones that are already big outside of the internet are investing more in it. The point is that you need something that gives you an edge. You can just go by the saying, “if you build, they’ll come.” If you don’t have a funnel that gets clients every day, they won’t come. So, you indeed need the course that will teach you all the ropes to become a funnel hacker. This will give you that edge over the competition that is already here, and the competition that is coming. You have to get the Funnel Hacks System. This is the easiest way to learn funnel hacking and ensure fast results. There are two main reasons to learn funnel hacking; time and money. You know that the slowest way to make a profit in any niche is to be the first one to do anything. When you’re the first one, you take all the risks and you make less money. In Clayton Christensen’s book “The Innovator’s Dilemma” he shows how disruptive technology takes a long time to find its customers. Something similar would happen if you didn’t use funnel hacking. You basically would have to waste time and money to figure out what works and what doesn’t. Taking all the risks yourself, when you finally found something that did indeed work, someone else would hack your funnel and maybe make even more money than you. So, instead of going through the harder path, take the funnel hacking one. The best thing is that fast results are not only possible but expected. The obvious reasons why this is the case is that you’re taking a proven concept, getting down to its fundamentals, building your own funnel on top of that, and getting immediate traction. It may sound like too good but it’s true in this scenario. This actually happens all the times in various industries. They take something that works from the competition and implement in their own process. Then, they just reap the rewards. So, that’s why this is a skill that you must acquire. You want to stop wasting time and build a funnel that gets you actual results. It’s time to see what works, implement on your funnel, and sit back and relax while the results trickle down. Now that you understand why you must acquire this skill and what is and everything you need to know about it, it’s time to get you an action plan. A step-by-step action plan that will teach you how to do this. The goal will be to be as clear as possible and easy to comprehend so you can start implementing this right away. Below is my funnel hacking action plan. If you’re getting started in a niche that you know well, this one will be easy. You have to create a list of all your competitors that matter. You know who’s number 1 in your niche, so that’s a great start. You don’t want to be reckless with this list, so make sure to include everyone that is clearly making money. After all, you only want to hack the funnels that are working. So, you can use software like Evernote, OneNote, or even a word processor. No matter which one you choose; the important part is that you make your list. At first, write down a list with 10 candidates for funnel hacking. Once you do that, it’s time to divide the list into main competitors and marginal competitors. The goal is to go after the main competitors. These are the guys that are bringing the most traffic and making the most money as well. If you want to be the best, you have to beat the best. So, it’s time to research. Write your list down to 3 main competitors. This is to make sure you don’t get overwhelmed, and then lost. This list will work as your map to guide you through the whole research. It’s important that you take your time because if you get this wrong, everything will fall apart. It’s like the base of a pyramid. It has to be strong to hold everything together. This list will determine the funnels that you’re going to hack. So, you need the ones that work. The ones that convert leads into customers. You should never trust just your memory for a job like this one. If you needed to remember every detail of an empty room, chances are that you would still be going to fail. Our memories aren’t reliable like a picture is. To get a screenshot of every page you can do it the hard way, which is to press the print screen button and paste the image on paint. Or you could get Awesome Screenshot, which is a free Chrome extension that you can use. Whatever software or method that you use, it’s important to make sure that you screenshot every single page. There are many details that you don’t even know that you’re supposed to look for, that are there for you to learn from. It’s like being a detective. Every minor detail matters. It’s important to get a screenshot of the ads that took you to the landing page. The landing page itself, and the copy. You have to record everything. Then, you create a file with every screenshot and your notes about the funnel inside Evernote or OneNote. You could create a folder in your computer with every information you have on the sales funnel. Then, create a checklist to help you evaluate those funnels. This is to help fire your brain into thinking about the funnels critically. You should be thinking about what is working and what isn’t. What you can improve on your own funnel. Once you have all those files, you can compare them. This way you can look for the similarities. This will make everything easier for you to hack. It’s like having your own database to pull from every time you need it. What most expert marketers won’t tell you, it’s that there’s a way to find out your competition’s secrets, and it’s not with truth serum. So, there’s something that could be called the “hidden web”. This is not to be confused with the deep web. This is related to marketing. Basically, we’re talking about the bits and pixels that you can’t see but are full of information about your competition’s success. This helps you put the pieces together. It’s an insider’s look into the whole story. This gives you information about how they are getting their traffic and how they are converting this traffic. Needless to say, this is crucial stuff. It can be your secret weapon to ensure that you are able to funnel hack their page. Before you get impatient not knowing how to do this, there’s a Chrome extension that will do all the work for you. The best thing is that it’s free. The Ghostery extension will show you every invisible activity that is happening on every page of your competition funnel. So, as you get screenshots, you can run the extension to get more thorough data. This software will give you a better idea of how they’re getting their traffic, but to have a better view of what they’re doing with this traffic, the best Chrome extension is BuiltWith. This extension will answer a few questions. With the two, you’ll be able to have a thorough analysis of how the competition is targeting visitors and everything else you need to know. Now, you should assemble all this information and put it together with the rest you’ve gathered so far. This will give you a good scope of how the competition is operating. Now, calm down. Hear me out before you call me crazy or throw the idea out the window, there’s a reason for it. You’ve already heard that you must keep the enemies closer. Obviously, your competitors aren’t enemies, but the saying works for this situation. The reason for that is that as much as all the tools in the world will help, they will never beat the experience of going through the entire funnel. The only way to do it, it’s to buy from them. If you don’t buy from the competition, you can only go so far. If you’ve ever heard of mystery shopping, it’s a method in which someone goes to a physical store and buys a product to evaluate how their salespeople treat the customers. The whole point is to assess customer experience. This step is somewhat like that. The difference is that you’re evaluating their copy. So, screenshot every single step. It’s there for the taking, and you’ve stumbled on a treasure vault with no curse involved. Make sure that you use every tool that I gave you so far, and gather all the data that it’s there. Put it all on your competitor’s file. This will, again, be your database on the competition. Every time that you need it, just access the file and find out what you’re looking for. To make as easy as possible, in your competitor’s file, you should have everything about them. And the information from the Chrome extensions. One final tip on this step of the process is to remember that you should gather the data from all pages. Too often beginners worry about the landing page and the final page. You should actually record everything. Upsell pages, cross pages, email sequences. After all, you better make sure your money doesn’t go to waste. This is where the fun begins. You have been working as a researcher so far. You’ve collected all the data and put it all into your database. You know everything that is to know about the competition. Now it’s time to create your own funnel. I suggest that you not only read the data that you’ve gathered but also analyze it. This means ask yourself a question like, why does it work? And not just what works? It’s important to your betterment as a marketer. Now, when we talk about modeling a sales funnel, too often people think they should model only the copy. As much as that it’s part of the process, it’s not the whole. You have to pay attention to the color scheme, the fonts, the positioning of the graphics. Everything. The reason is that those things also help you make the sale. As much as it doesn’t sound that logical, those elements play a role in the lead’s subconscious mind. There’s a reason companies spend millions of dollars designing their products’ packaging. It matters. The look and organization of the pages of your funnel are the packaging of it. So, take it that seriously. It’s important that I emphasize to you that if you do follow these steps, you will dominate any niche that you choose. Now, if this is your first one, stick to a niche that you know. Now, beginner or not, you may wonder how to build your funnel. I’ll get into more detail below, but you should take a look into ClickFunnels. It’s user-friendly and you don’t need any coding experience. This is when you’ll be looking for the landing pages and home pages. Here it’s important to keep in mind that you’re not straight out copying the design. You’re not carbon copying anything. You’re getting inspiration from a successful page. You’ll be funnel hacking live. I’m not sugarcoating or putting a spinning on plagiarism. Even though it doesn’t apply here. What I’m talking about is creating a version on top of the one that you know it’s working for your competition. Imagine that you’re just getting to know a new company, but their logo looked like Nike’s. You wouldn’t want to buy from them. You want something that doesn’t look like a Chinese knockoff. So, the secret is to use a similar color and design, but never the exact same. You want to make people feel the same thing they feel when they’re on the pages that convert without them noticing that yours is similar. If you’re using ClickFunnels, they let you do this more easily than other platforms. They even have video tutorials that explain to you how to do it. Now, remember to pay attention to the copywriting, the design and placement of the buttons, the CTAs (call-to-action), the testimonials and the videos. Basically, everything that composes the pages. This stage is the most overlooked when people are building their sales funnel and/or studying the competition. These pages are the ones that show up after a certain action is taken on the website. It may be after you’ve given your email address or after you clicked a button. Whatever it is, this page will try to get you to take one extra action. Now it’s the time to you pay attention to everything the competition is doing. Take screenshots of every page and make sure that yours have the same fundamentals. You have to make sure that your upsell pages convert just as well as the landing pages and the home pages. Do not overlook this step. It’s crucial for you to make even more revenue. So, if you’ve been doing everything right, your funnels will now have a landing page, an upsell page, and a downsell page. Maybe even a home page that is different from the landing page. Only when you make sure that these pages are perfect and ready to go, you can start the next and last step to make sure that you funnel is on point. Now you’ve finally made it. You’re at the back-end of your funnel. It’s also time to be as honest as I can be. There’s a good chance that you won’t see this part of the competition’s page. To get to the back-end of the funnel, you have to purchase their product. So, unless you want to spend thousands of dollars on the competition, you won’t get to see it. Still, I’m not going to leave you with nothing. There’s a way to make sure that you build incredible and effective back-end pages for your sales funnel. All you need is to read Dotcom Secrets by Richard Brunson. The founder of ClickFunnels goes out of his way to explain every possible tactic used to create a back-end page of a funnel that works. Here you get a wealth of information about all you need to create a page that will convert like never before. It gets even better when I tell you that the book is free. Get ready to learn everything about sales funnel hacking. So, that’s it. Now, you still have to study the competition. For your sanity’s sake, I’d advise you to study only 3 sales funnels to not get you overwhelmed. Take notes of everything I taught you here like the copy, design, and etc. Make sure that you strip it down to its essential to see what’s making it work. Now, let’s look at funnel building tools to make sure you choose the right one for you. ClickFunnels is my preferred online marketing tool that makes the entire process from lead generation to purchase easier. Imagine that you can do everything without any knowledge about coding and web design. ClickFunnels allow you to do just that. I personally use Clickfunnels and have written a detailed Clickfunnels review explaining my experience with this funnel building tool. It is definitely worth a read. Clickfunnels also gives you the unique opportunity to try their product for free so you have nothing to lose really. Click here to get your free trial, you can cancel it within 14 days if you don’t like the product and you will not be charged. You’ll be able to create all the pages of your sales funnel with them without breaking a sweat. It gets even better because unlike other services, you don’t need third-party integration with ClickFunnels. So, you get to create all the pages with their software without needing to learn how to code, you get a web hosting cloud-based service, and then, you get training. If you’re new to sales funnel, you can learn everything you need to get started with their training. With ClickFunnels you get a software that integrates every aspect of creating a sales funnel. This way, you get everything in one place. Then, they also give you access to their Facebook group so you can chat with like-minded entrepreneurs. In plain English again, you can build a funnel in a few hours without any previous knowledge. You’ll be able to create all the pages of the funnel even if you know nothing about how to code. Basically, you’ll learn growth hacking with ClickFunnels. Shopify is a good option to build sales funnels, especially if you’re in the e-commerce business. Its software is safe to use and works well with your Shopify store. Now, there are a lot of disadvantages when compared to ClickFunnels, for instance. If you’re a beginner, Shopify can become a problem because many of its best themes require some coding knowledge to make it run correctly. Also, Shopify forces you to run with third-party apps, which in turn makes your website run slower. Unlike ClickFunnels, the need to use third-party apps is required and will be in detriment of the user’s experience. So, if you’re not integrating the sales funnel to a Shopify store, which will offer you great marketing tools and a huge variety of themes, it’s not the best option. Shopify also charges a fee on every transaction, which it’s definitely not a plus. Let’s get out of the way that WordPress was not created for building sales funnels. The platform is widely popular because it’s free. Now, WordPress was created to build blogs and websites. It’s one of the best software in its niche, but when it comes to sales funnels you probably want a specialist. Even though WordPress is free, it’s best used when you host your website somewhere else. The free version where you host your website with them is even worse. My advice would be to not build sales funnels with WordPress. Only complete beginners and amateurs would do so. If you’re serious about your business, you need to go with the best option. Or at least, choose the one that was made to host sales funnels. As an experienced marketer, I’m going to be transparent here. The best option by more than a mile is ClickFunnels. They help you automate the entire process. And they make it easy since you don’t need to know how to code. If you haven’t already, please also read my full Clickfunnels review here. Do you want to change the placement of a button? Easy, just drag and drop. You don’t need to know how to code. It’s so user-friendly that a kid could learn how to use it in a day. Now, it’s not just the easiest one to use. ClickFunnels is the best because it does multiply your sales by 10-fold and automates the entire sales process. 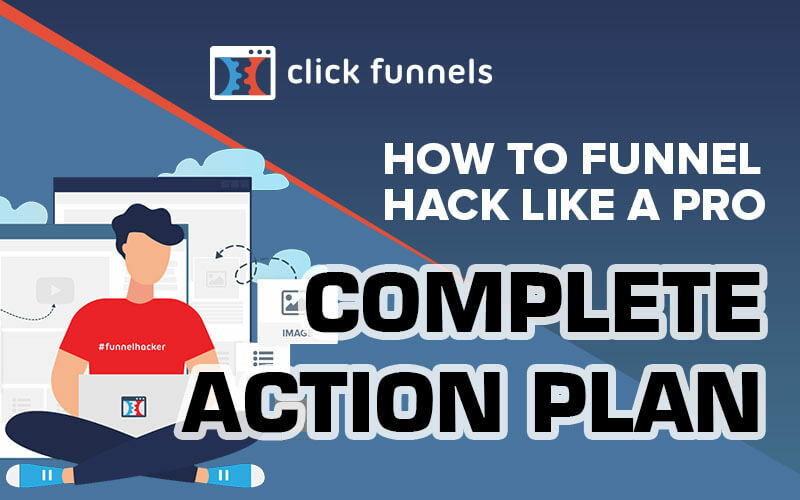 I’m telling you, if you use my action plan to funnel hack with ClickFunnels, you’ll see results fast. With ClickFunnels funnel hacking is easy and quick. Again, businesses that start to use ClickFunnels see a 41% increase in their sales revenue. You can sign up for a free 14-day free trial and see for yourself right now. As always, I hope you enjoyed reading this post on Funnel Hacking and you will now be able to Funnel Hack like a PRO. If you have any questions, please leave them in the comments section below or get in touch via my contact page. Thank you. What is Funnel Hacking and How to Funnel Hack like a pro?